This is the nice design that I used on page 2 of the book. Annoyingly, rather a lot of other people discovered it before me: it's indexed on Wikipedia as the Apollonian Net, after Apollonius of Perga (~262 BC – ~190 BC), and it's also referred to elsewhere as the Leibniz Packing diagram, after Gottfried Leibniz (1646-1716), Newton's rival for the invention of calculus. I've even seen it credited to the design of the floor of a Greek temple. But frankly, it's such a nice shape that I'm sure that people have been discovering and rediscovering it for millennia. Draw three touching circles, fill in the inviting gap in the middle with more circles, and when you're feeling pleased with yourself and wondering what to do next, step back and look at the whole thing, draw in a bigger circle to enclose everything (facing away from you), and repeat. That's how I got there, anyway. There's some rather interesting geometry here to do with tangents, but I got impatient trying to get a complete derivational method, and generated the figures using a vector graphics program (CorelDraw10), driven by an automating script, using a mix of partial derivations, testing, and brute force. If you're calculating a chain of circles that might be twenty or thirty stages long, successive rounding errors tend to screw up these diagrams when you calculate them "properly"(look at the overlap of the smaller circles in the Wikipedia vector graphics version), and my priority was to make sure that the circles really did fit, so I used a hybrid approach where I used trig to get each circle into the ballpark of its proper destination w.r.t. its parents, and then a successive approximation method with error correction to tweek and nudge and jiggle everything snugly into place. 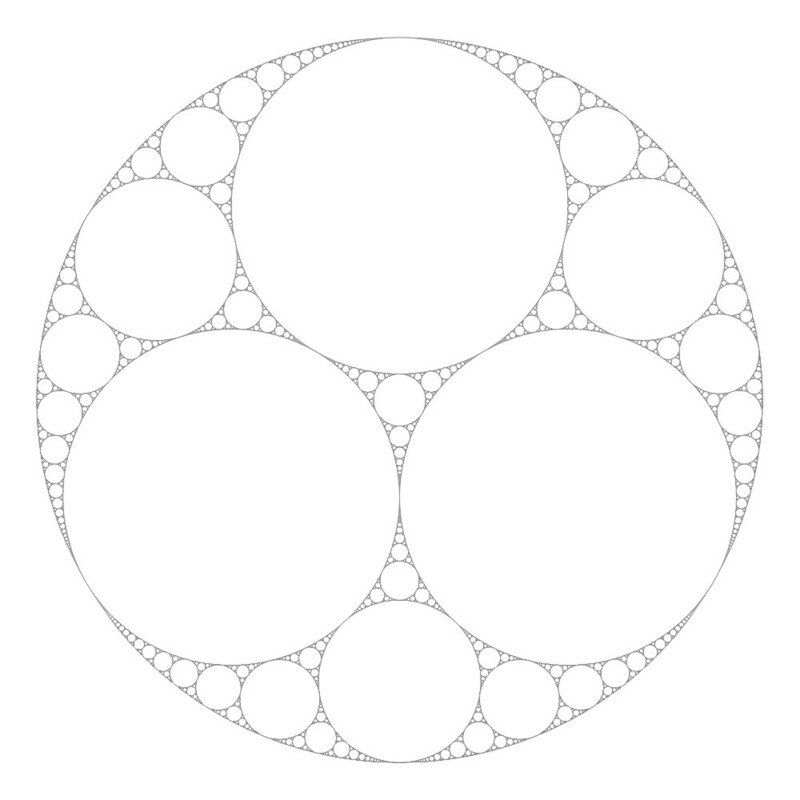 The Apollonian Net makes more sense when you stretch it over the surface of a sphere, so that the four largest "primary" circles are all the same size, and are explicitly equivalent. They then form the intersection of the sphere with the four faces of a tetrahedron, giving the fractal-faceted solid that I used as a vignette on page 378. 1: Start with a sphere and grind four flat circular faces into it that correspond to the four faces of an intersecting tetrahedron, then keep grinding maximum-sized circular facets into the remaining curved parts, ad infinitum. 2: Start with a tetrahedron, and lop off the four points to give a shape with four regular hexagonal faces, and four new triangular faces where the tips used to be. Then continue lopping off the remaining points, ad infinitum. Each wave of cutting creates a new face at each cut, and doubles the number of sides on all the existing faces. If we cut at a depth that'll keep these polygons regular, then with an arbitrarily-high number of cuts, the faces converge toward perfect circles, and the point-mesh of the resulting peaks converges downwards to settle onto the surface of the sphere used in method 1. This sort of duality is common when we construct standard polyhedra – the network of relationships in a regular polyhedron tends to be another regular polyhedron, so we can usually get to a regular shape by starting from either of its two relatives. Four of the five Platonic solids pair up nicely like this, and the last – the tetrahedron – is a special case whose "dual solid" partner is another tetrahedron. But we normally only consider these sorts of dualities when considering combinations of regular polygons with finite numbers of rectilinear sides with each other, and don't include the infinite-sided fractal shapes that show up when one of the parent solids is an infinitely-faceted sphere (which, in some ways, almost counts a a sixth Platonic solid). We don't have to start with a tetrahedron, we can make these fractal solids from any regular polygon (cube, etc). But the tetrahedral and icosahedral versions probably look the nicest. I find the cube-based version a bit disappointing, but I grew up with rounded-cornered dice with circular faces, so perhaps I'm just a bit blasé about the solid that corresponds to the "six-circle" version of the Apollonian net. (3) we can vary how the cutting is done. If we make our cuts too shallow, then the facets are distorted away from circularity, and the overall shape isn't a sphere, but has flat-topped bulges where the original polyhedral points used to be. If we cut too deep, we get bulges in the shape of the original solid's "dual" sibling, with each bulge tipped by an edge. Another cool thing about these nets is their topological transformability. With the "closed" version, every circle has three parents of the same size of larger, including the four primary circles (who count as each other's parents). You can transform between the different versions of the net by warping and resizing, while still keeping everything as circles. This lets us get to tilings that don't automatically suggest standard polyhedra, such as the "two-large-enclosed-circles" version that I used for the "fractal Yin-Yang" symbol on page 145, and the asymmetrical versions on page 224. And once I'd written the scripts and code to generate these figures, I had a few more blank bits in the book to fill, so I knocked up the "triangular boundary" version on page 370 which, actually, has some other interesting proportions. 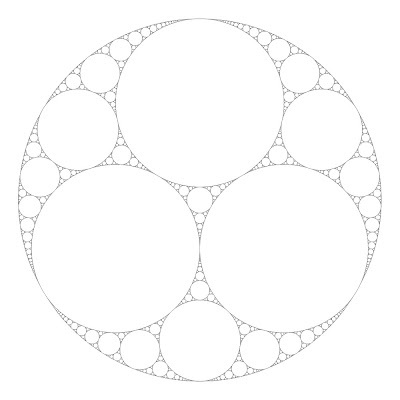 The "triangle" version includes parts that represent the limiting case of the edge of the Apollonian Gasket when we zoom in so far that the outer circle tends toward a straight line. Filling these voids then gives the special-case Ford Circles tiling. Some serious people have worked on this subject. You can also Google Descartes' Theorem (after René Descartes (1596-1650), and Soddy Circles. Lester Ford and Frederick Soddy only produced their papers in 1936 and 1938, so the Apollonian Net involves math research that extends across more than two thousand years, and isn't finished yet. It would have been nice to meet the person who designed that floor, though.